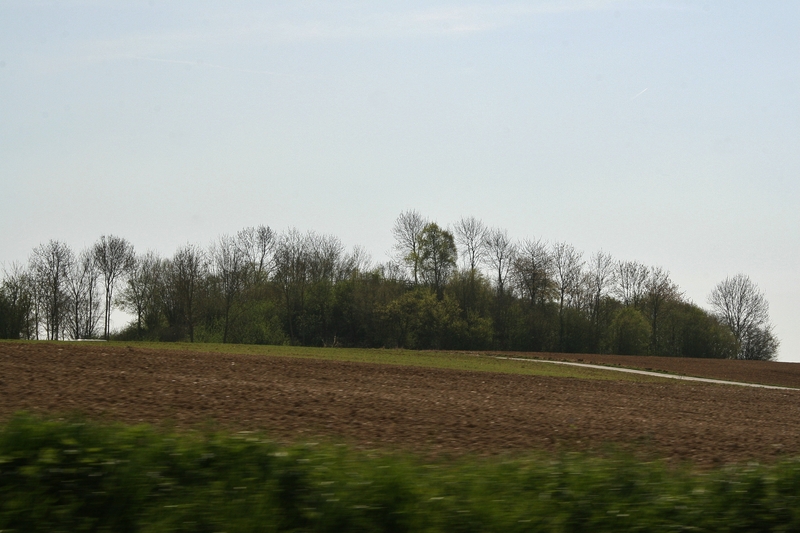 The Butte de Warlencourt from the Albert-Bapaume road. 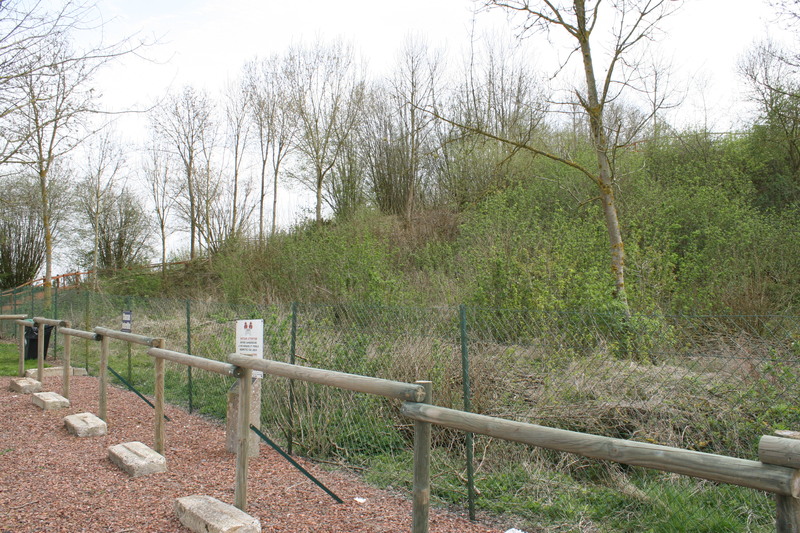 The Butte de Warlencourt is an ancient burial mound about four miles south of Bapaume, and half a mile north of the village of Le Sars. Up close it doesn’t look much, and it’s only in the last few years that the wooden walkway that you can see to the left of this photo has been installed to aid access to the top. …but also a mass grave. 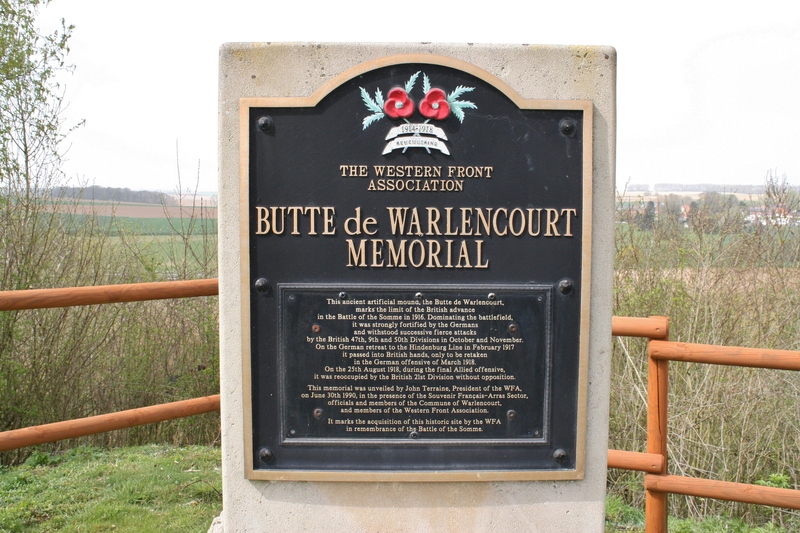 It was more than three months after the start of the Battle of the Somme in July 1916 that the British finally found themselves in a position to attack the Butte. 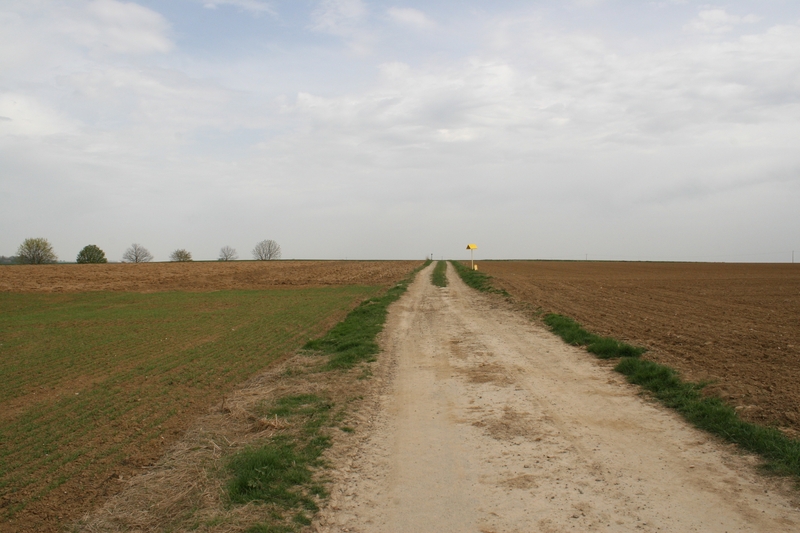 The Battle of the Transloy Ridges, as the actions on the Somme between 7th & 20th October 1916 became known, took place along a three and a half mile front from just north of Le Sars, on the Albert-Bapaume road, to the village of Lesboeufs, the furthest southern point of the British trenches on the Western Front, where the French Army took over the line. Following more failed attacks on 8th October, the Londoners were relieved by the 9th Division on 9th October. Three days later the next major attack, this time by men of the Seaforths and Argyll & Sutherland Highlanders, alongside South African troops, again prove a costly failure. 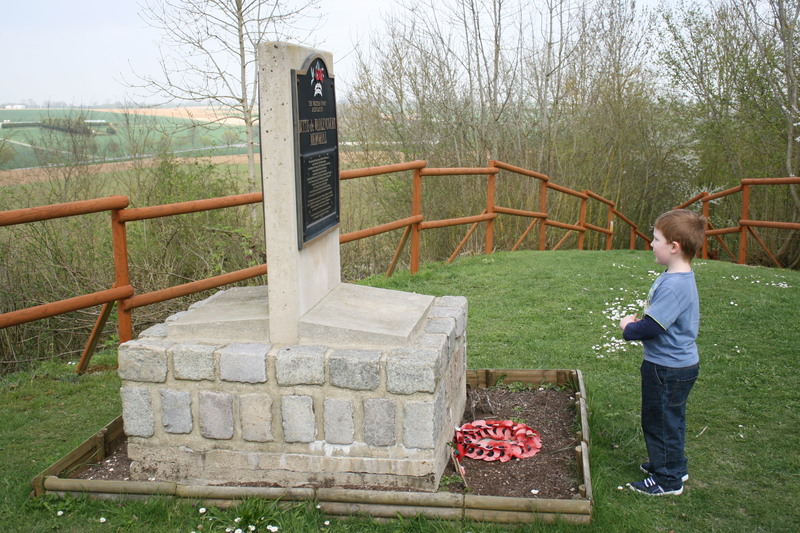 The Scots, attacking over the corpses of the men of the London Division who lay in long lines in front of the Butte, considered their experience here, a place ‘guarded by slime and weather’, the worst they had encountered anywhere on the Western Front, and that included the fighting at Delville Wood earlier in the summer. In the early hours of 18th October the British launched another attack, the South Africans finally taking the remains of Snag Trench, a trench in No Man’s land about three hundred yards south of the Butte. It seems that they briefly took the Butte as well before a German counterattack forced them back. More attacks followed in the evening before heavy rain brought the attempt to a halt. The Battle of the Transloy Ridges came to an end on the 20th October with small gains for the British along much of the front, although the Butte remained in German hands. 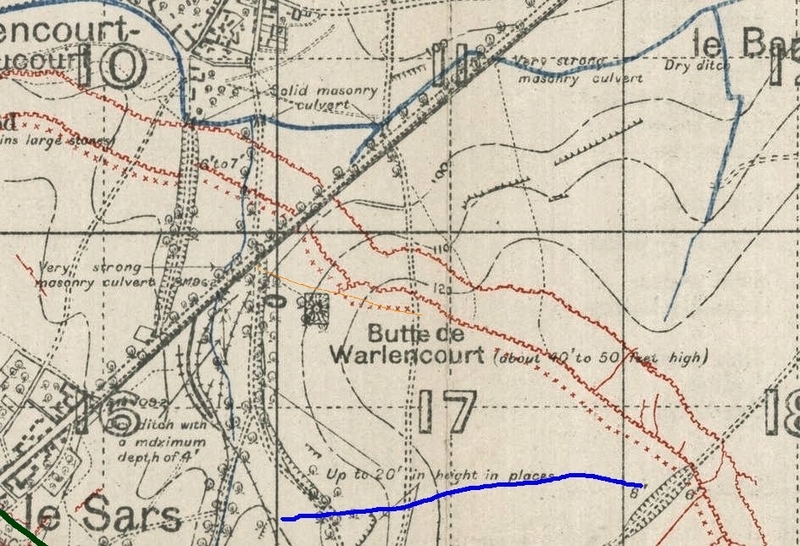 Trench map showing the Butte de Warlencourt in 1916. The German front line trenches (Gird & Gird Support) are marked in red. I have added the British front line in green in the bottom left hand corner, and Snag Trench in blue. 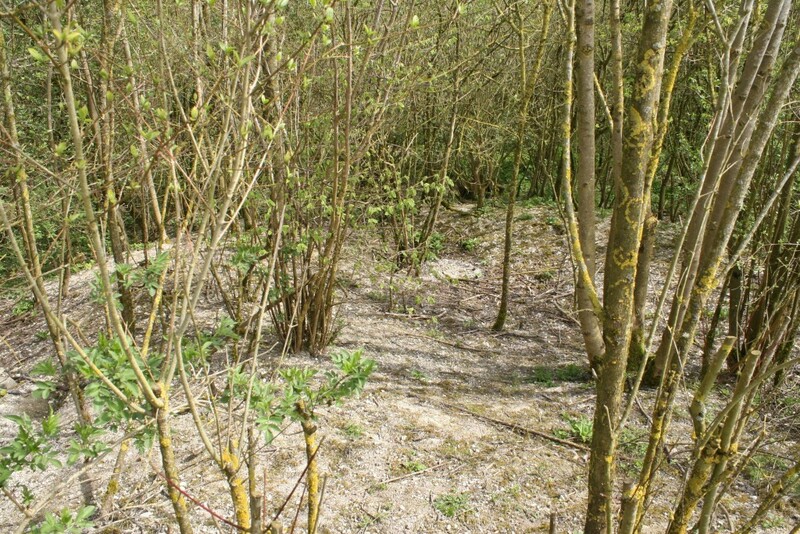 April on the Somme. 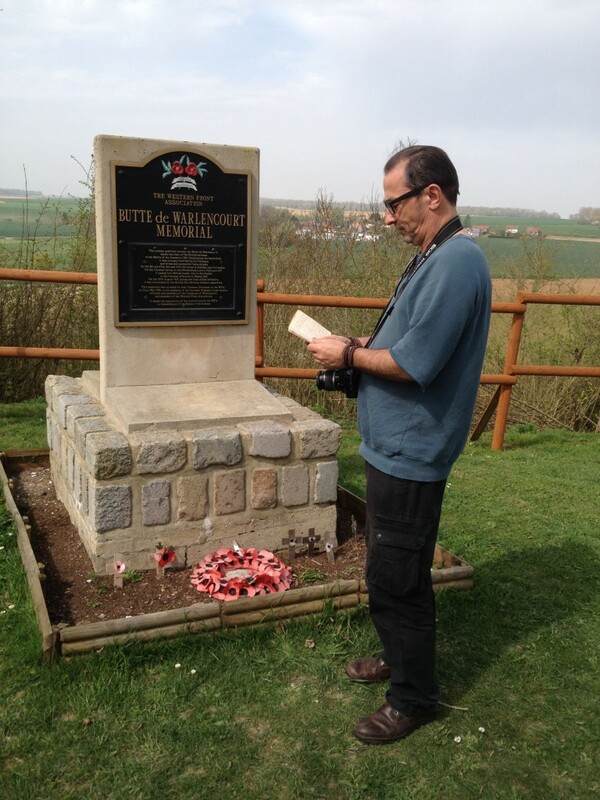 Or Baldrick on the Somme in April, if you prefer. Anyway, let’s go up and take a look around. 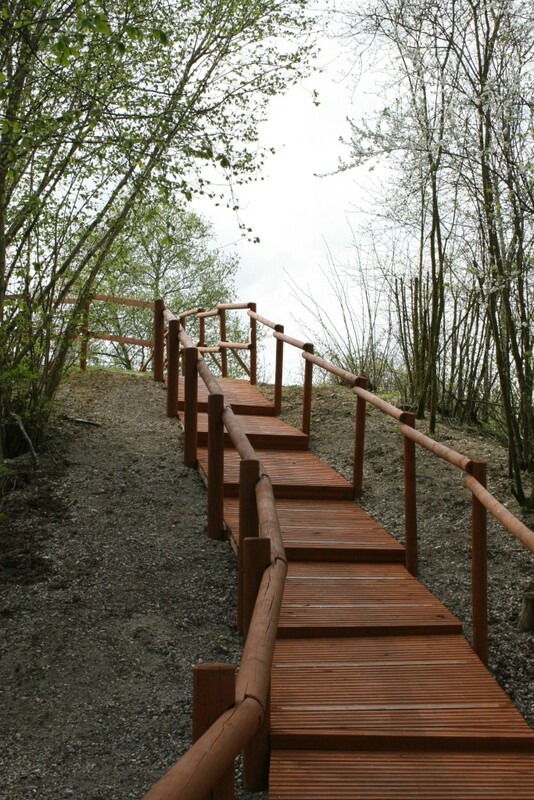 I can’t imagine that it was that easy getting to the top, particularly in inclement weather, before these new steps were installed. 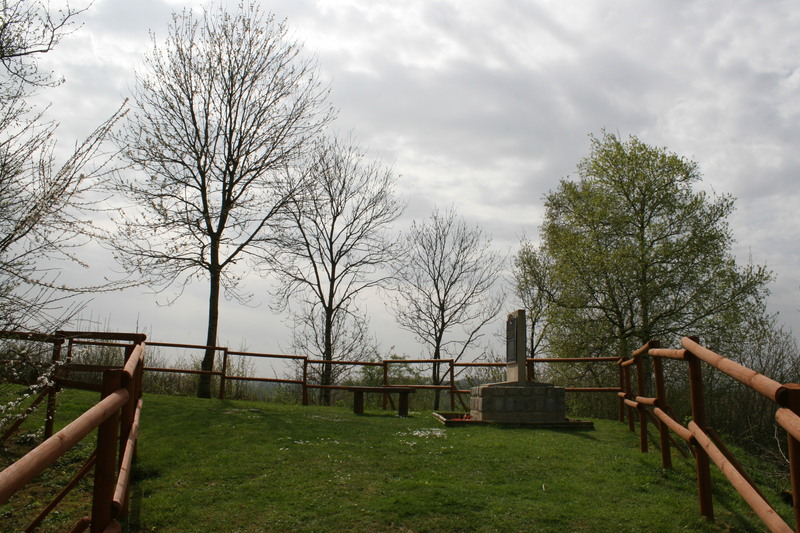 …and the Western Front Association memorial (above & below), inaugurated and dedicated on 30th June 1990. Although the Battle of the Transloy Ridges had ended, the fighting at the Butte had not. On 24th & 25th October 9th Division was relieved by 50th Division, having sustained some 3200 casualties during their tenure of the line here. Although the next attack on the Butte was planned for 26th October, it was postponed, initially until 28th October, as preparations were made and trenches repaired. By then, however, incessant rain had turned the battlefield into a quagmire and it was not until 5th November that conditions were deemed suitable for the attack to take place. The weather was once again bad overnight, but by the morning had cleared, although conditions underfoot were still appalling. 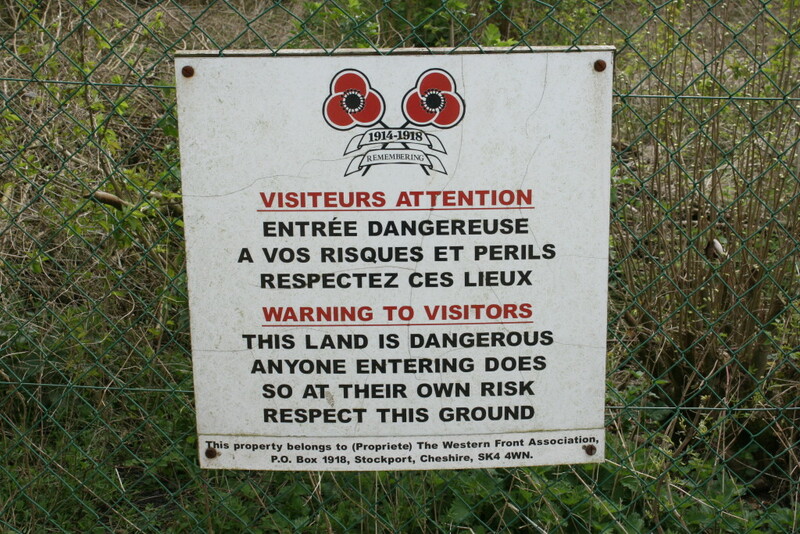 On the morning of 5th November the men of the Durham Light Infantry, supported by the Northumberland Fusiliers and Australians on the flanks and with the Border Regiment in reserve, left the front line trenches, now including Snag Trench, and advanced towards the Butte and the German lines beyond. 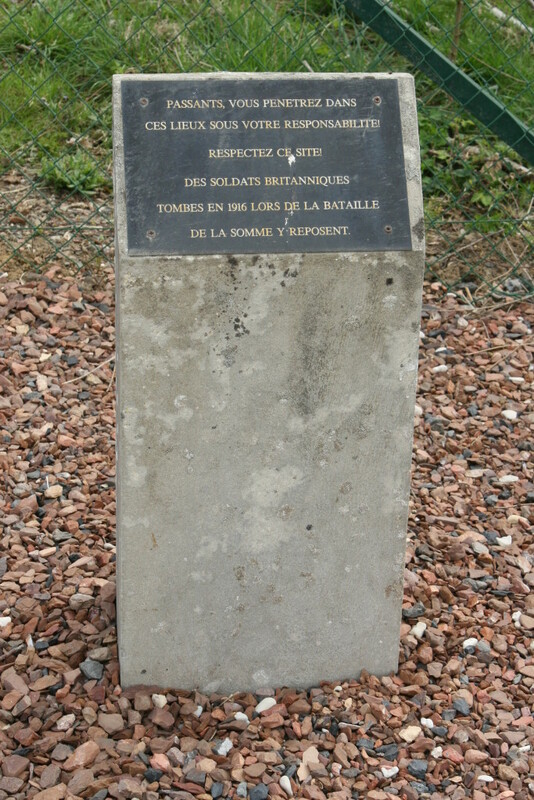 Following a creeping barrage the Durhams reached and captured the German front line, Gird Trench, on the Albert-Bapaume road, where they dug in, and succeeded in forcing the Germans off the Butte, although fierce fighting continued. In the afternoon the Germans counterattacked, driving the Durhams out of Gird Trench. Just after midnight a major German attack pushed the Durhams off the Butte, and by early afternoon the British were back where they started. Another attempt to take the Butte had ended in failure. *Bradford had won his VC on 1st October during the fighting that would bring the British into a position to attack the Butte. Me and my little book. 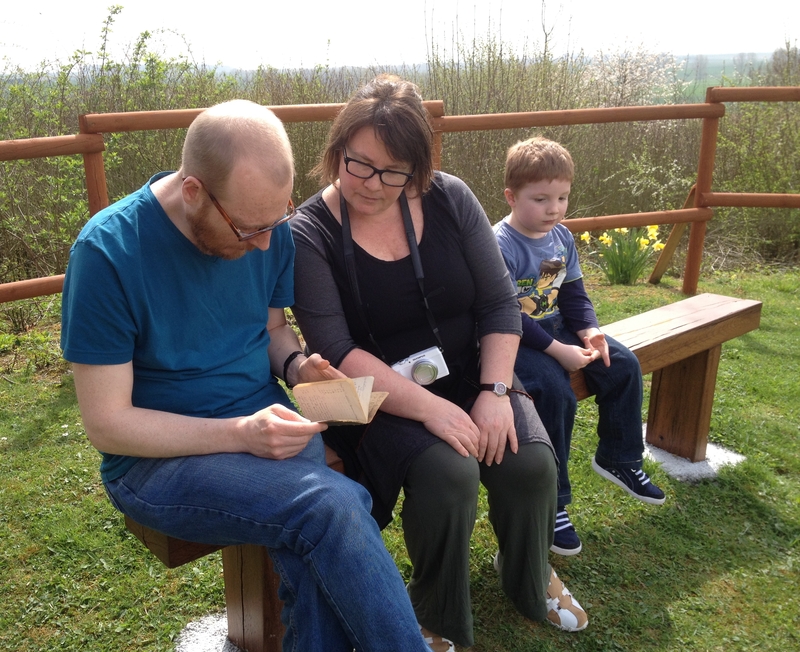 Above & below: The family Baldrick peruse the book. Well, two of them, anyway. 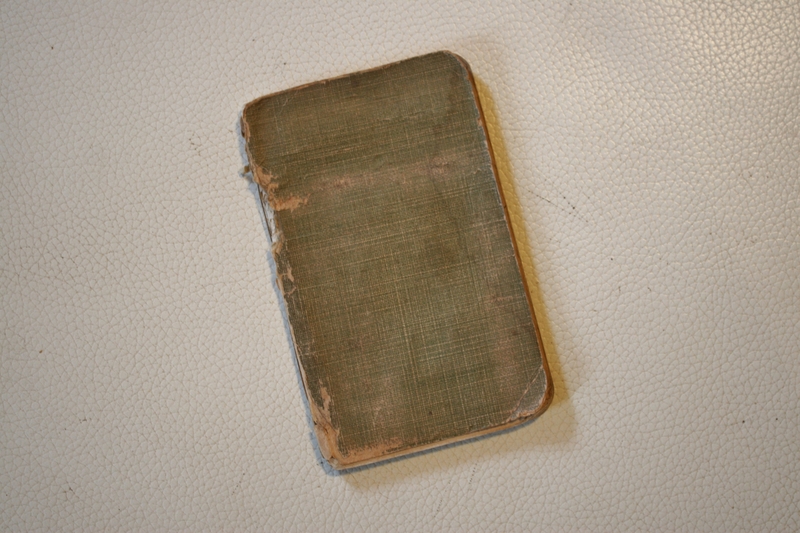 Not a book really, but a diary. A bit like the Butte, it doesn’t look much. 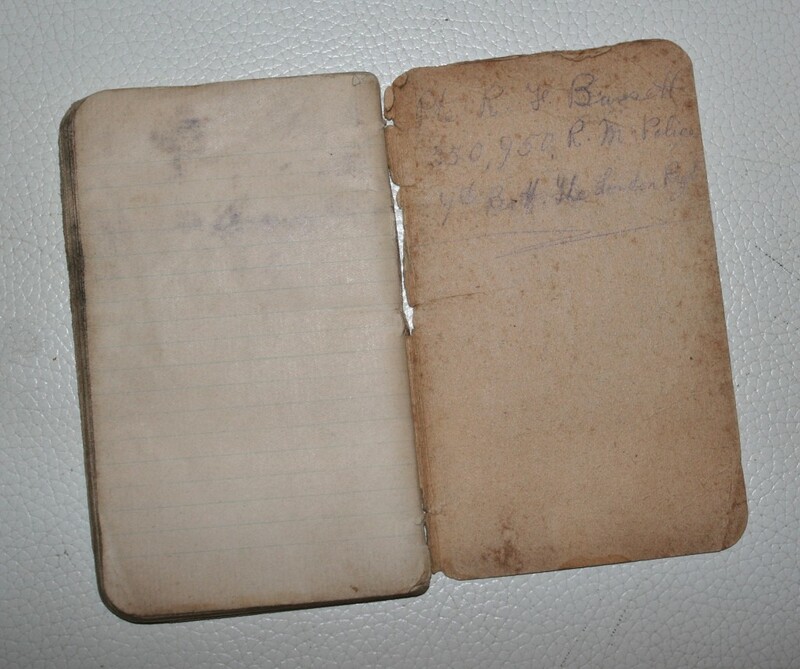 It once belonged to Private Richard Frederick Bassett, who fought with the 1/7th London at the Butte in October 1916 (you will find his Casualty Form at the end of this post). Oct 5th: Left Mill Street at night for the line at Beaucourt Abbe releiving the 22nd London. Oct 6th: Still in the line. 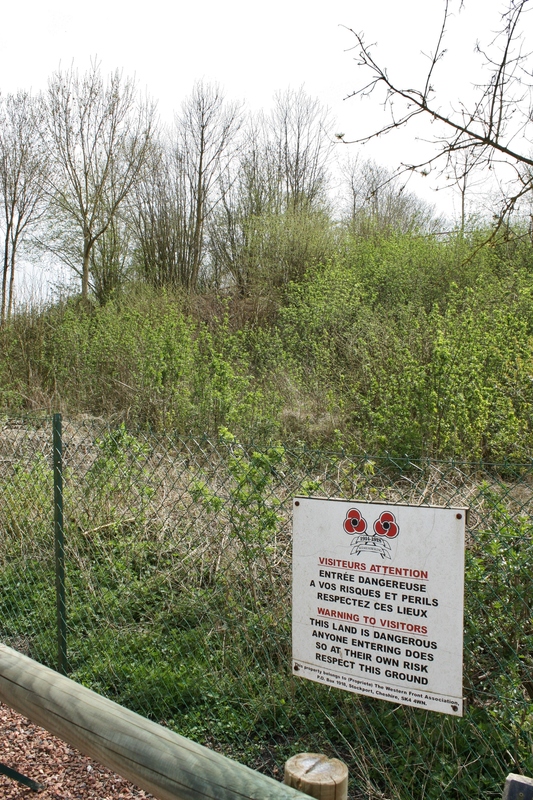 Oct 7th: Still in the line and made an attack on the Butte de Warlencourt. Tanks again in action, we met great opposition, losing very heavily. Oct 8th: Holding the line we gained. 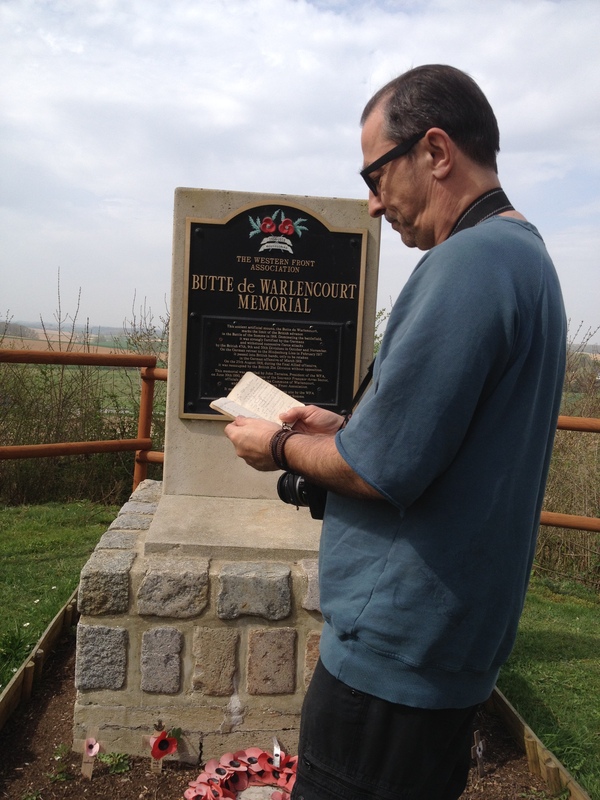 And now you know why, when we were planning our trip to the Somme, a visit to the Butte was top of my list. To look out over the view from the top of the Butte, reading the words of a man who, nearly a hundred years ago, fought for his life somewhere down there in those fields, is a unique experience, and one that I can’t really put into words. Of course, the Germans couldn’t exactly stand on the top as we are, but the Butte was higher in those days. 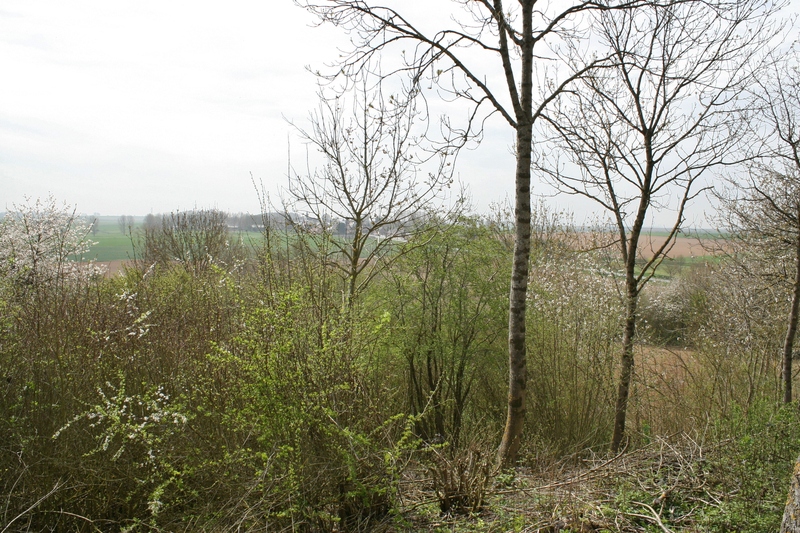 Either way, you get an idea of the excellent views towards the British lines and beyond that the Butte commanded (the Albert-Bapaume road visible through the trees in the centre). And the British initially considered it worthless. 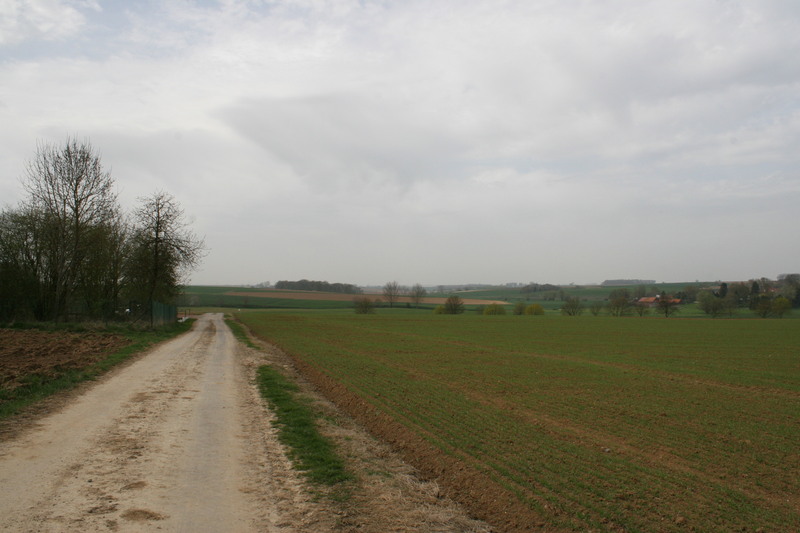 View looking north, the main road in the dip in the valley, and Warlencourt British Cemetery visible just to the right of centre. Not only was the Butte a superb observation post for the Germans, they had also dug and tunnelled deep beneath it. 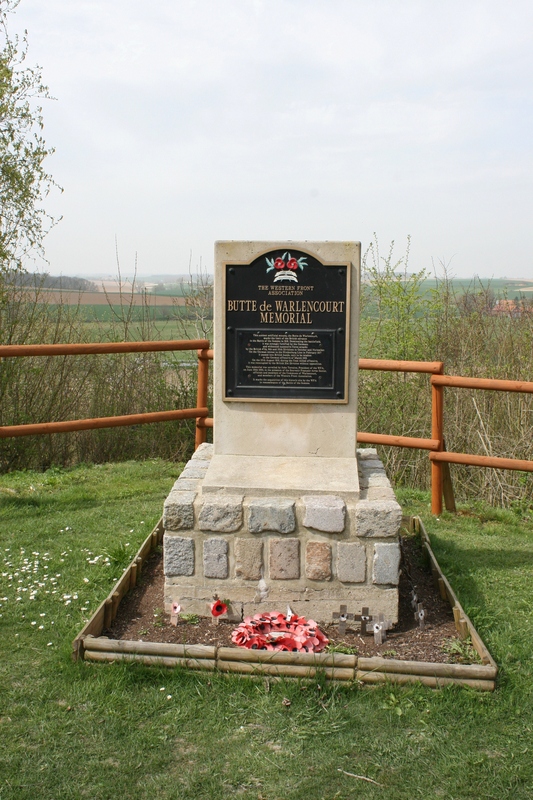 After the Battle of the Somme the Butte remained in German hands until 24th February 1917, when, as the Germans retreated to the Hindenburg Line, it was occupied unopposed by Australian troops. The track past the Butte looking west towards the main road. …I wanted a few photos of the Butte and surrounding countryside from the east, the German side (see following photos). Baldrick, handily, took this shot not only of me in the distance, but of the entrance to the Butte, a picture I failed to take earlier. 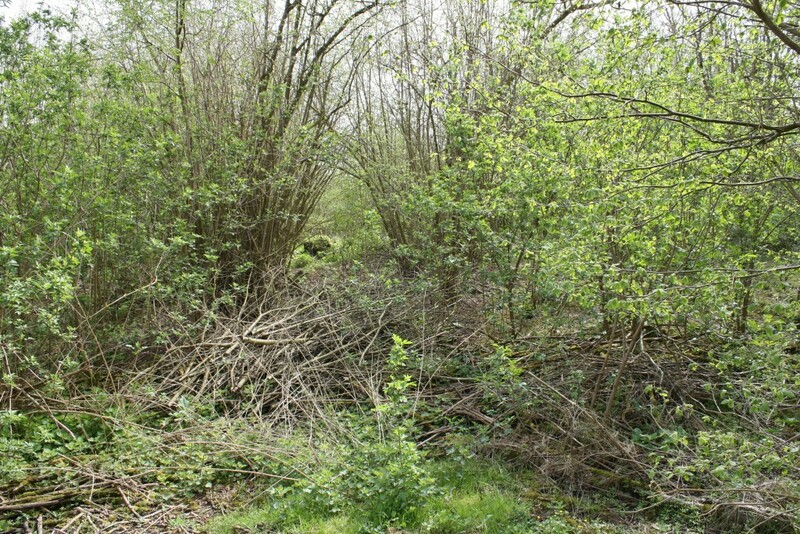 If you’d visited just a couple of years ago this would have been a far more unkempt place, the W.F.A. having recently done a fine job to make visiting a more pleasant experience. The track past the Butte looking west. The Albert-Bapaume road follows the line of trees on the right. Panning right from the previous shot, now looking north across the valley towards the village of Warlencourt-Eaucourt. 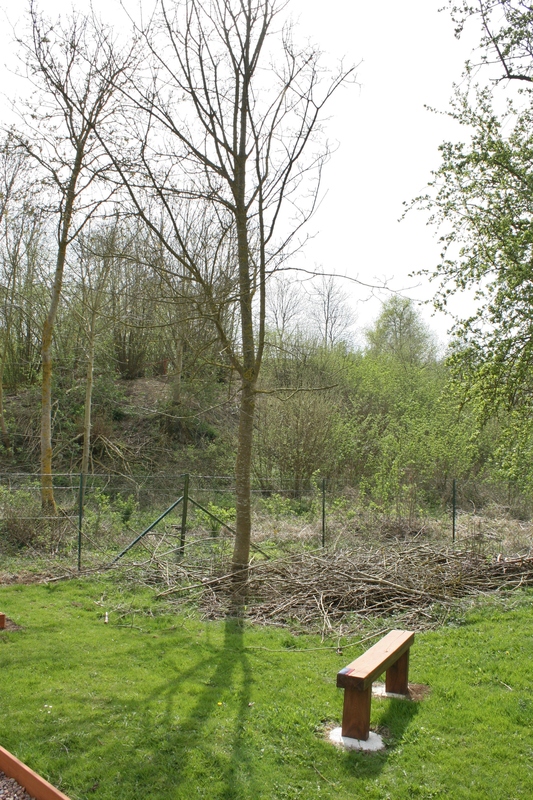 The German front line trench (Gird Trench) ran alongside the track (see next photo) before running down the field to the bottom of the valley, crossing the road, and continuing up the slope in the distance to the left of Warlencourt-Eaucourt. And now looking east, Gird Trench more or less following the track as far as you can see until it began to turn southwards over the horizon. You can view all this on the trench map; if you look carefully you will notice I have added this track in orange just to the north of the Butte. 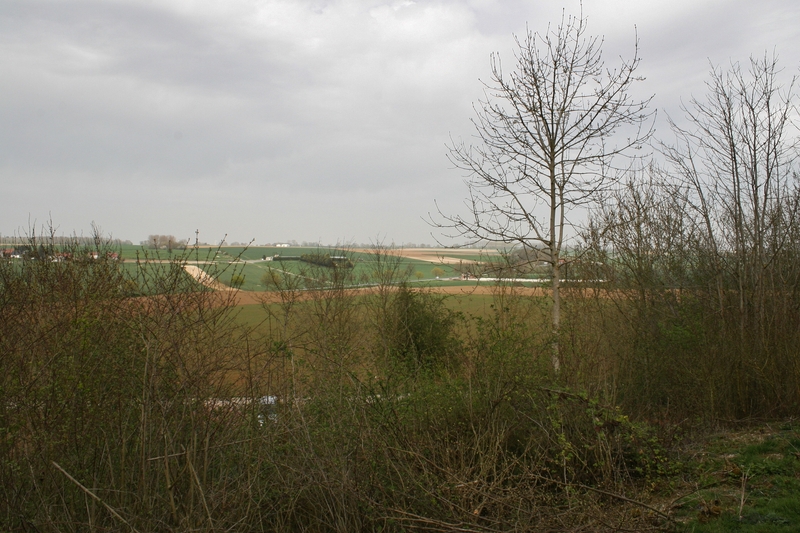 Somme panorama. 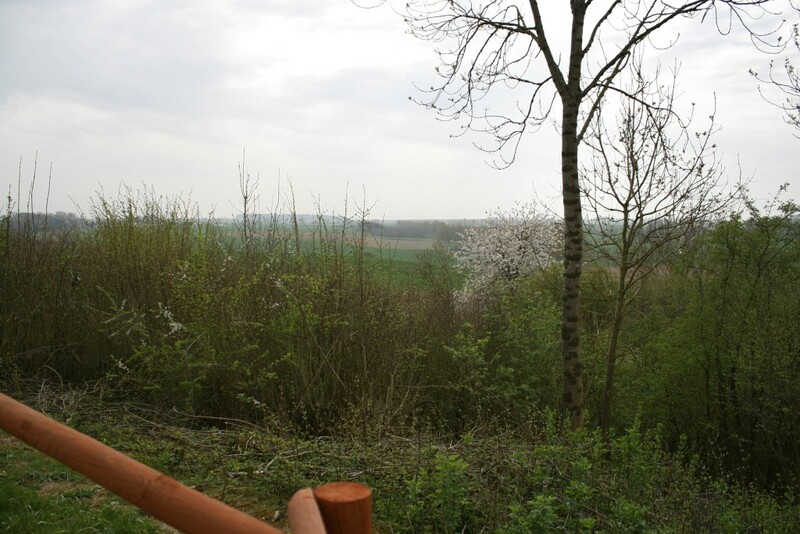 The Butte was once more captured by the Germans on 24th March 1918 as the last German assault on the Western Front attempted to break through the British lines once and for all. Finally, on 26th August 1918, it was again taken by the British during the Second Battle of Bapaume. 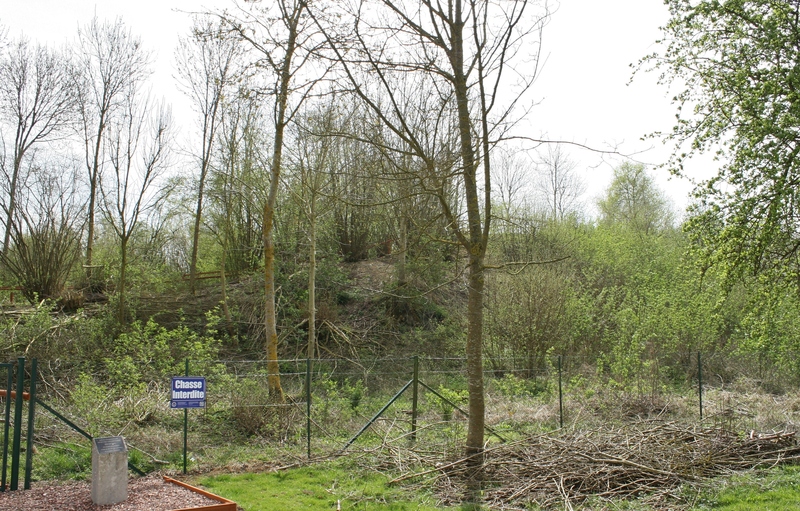 The Butte de Warlencourt is a peaceful place now, and, thanks to the W.F.A., who now own it, will remain so. But once it was a terrible, terrible place. Never forget. Click here if you’d like to take a look around Amiens next. This entry was posted in Documents & Artwork, The Somme. Bookmark the permalink. Possibly the fastest reply ever to a post! Or does MrBob hold that honour. I’m unsure. It’s an interesting place, the Butte. Glad you found it so, reading about it here, Chris. The completely different perspective that is necessary, as you mention, is absolutely right. As we’ve said before, we have no conception of the absolute horror that millions of ordinary blokes had to contend with. I’m also not so sure we have much insight any more into the mentality of the age. The whole concept of going down to the recruiting office with your mates to fight for your country, for example, seems, dare I say it, an almost alien concept today. Likewise with the generals. I don’t believe that many of them (not all) saw their men in the way that a modern general would, and I think that had a lot, in the British Army, to do with class. Which, down the line, had a lot to do with the number of casualties in unnecessary, unsuccessful, attacks. Anyway, what do I know? Bearing in mind your career, you probably know far more about all this than I do. I joined the Army in 1974. On our first day, the first lesson was just a reading of martial law (most articles ended with “execution by a firing squad”, LOL!). But the second lesson was about “Orders”; especially when an order was to be followed (given by a superior, for the good of the service, not involving a crime and so on). But then we were told that we could refuse an order (that was fully correct), and one of the reasons to refuse an order was when we estimated that the cost in casualties would be to high! I can imagine! Fascinating Chris. That is very interesting to hear. I wonder when that was introduced into the Belgian Army? Perhaps after the Great War? I have added some stuff to the end of this post that you might find of interest. You mean the paperwork about Private Bassett? Yep, he survived the war; wounded in 1915 and gassed in 1918. 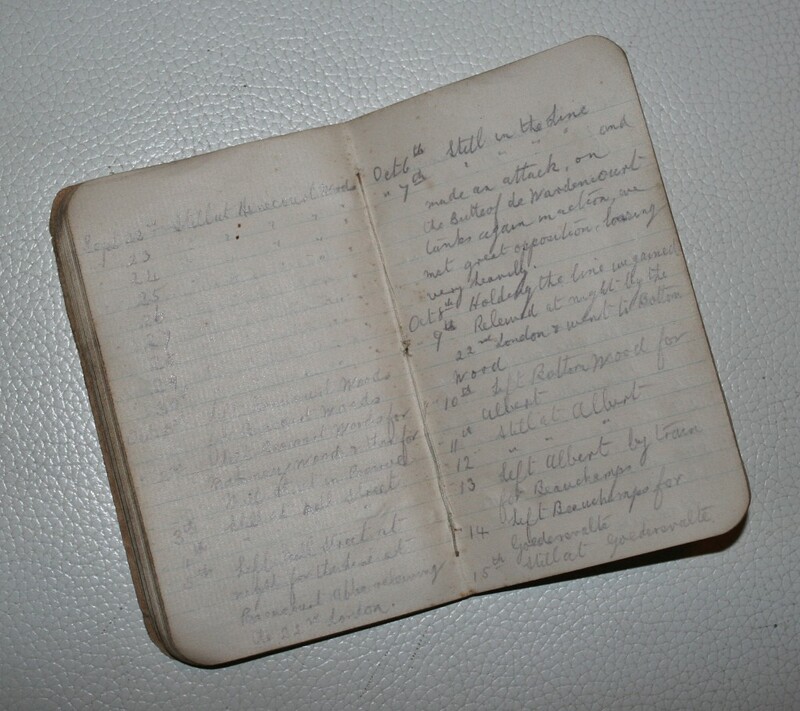 I was given the diary only a couple of years ago by someone who wanted to find a good home for it (they were not a relative of Private Bassett). Lucky me, eh? Thanks Kath. It was an interesting one to write. One of these days I shall see if I can find out a bit more about Private Bassett. A cursory check suggests he survived the war, but I know no more at the moment. I know a bit more about him now, if you’re interested. I have added some stuff to the end of the post. 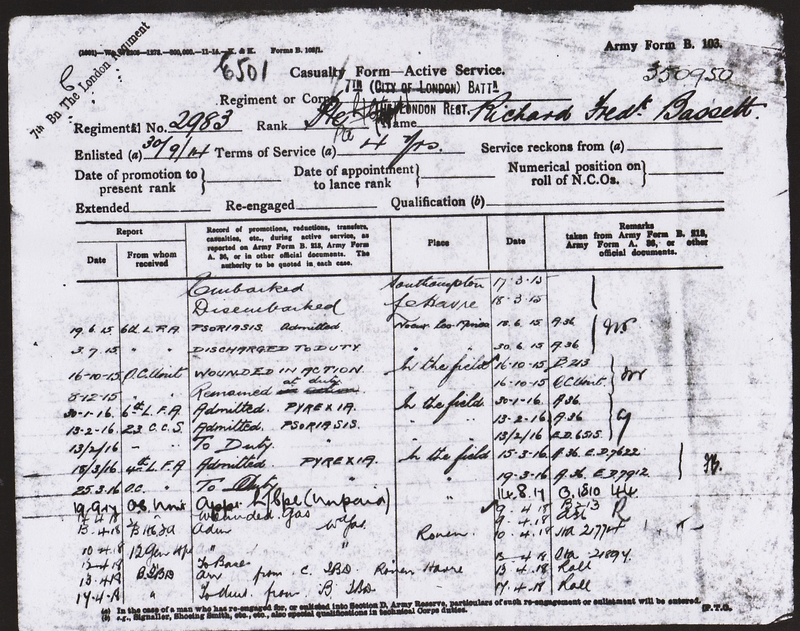 Reading Richard Basset casualty form he was made L/cpl unpaid, cannot make out it out completely, it looks like he reverted back to Private at end of service. There must be another story how him being a old hand, should have left the Army at a higher rank?. Hey Joe (one of my favourite songs!). You’re a gent, my friend. You’re opening comment is most kind! Yes, Richard Bassett was indeed made L/Cpl unpaid in September 1917 (I would guess due to heavy casualties) and, as you say, reverted to Private soon after his return to England in July 1918 (the forms should enlarge considerably if you click ’em). You would have thought he might well be a hugher rank by then, he’s clearly a literate man, but maybe he didn’t want a higher rank. Or maybe, for reasons unknown, his superiors didn’t consider him for promotion. We’ll never know. 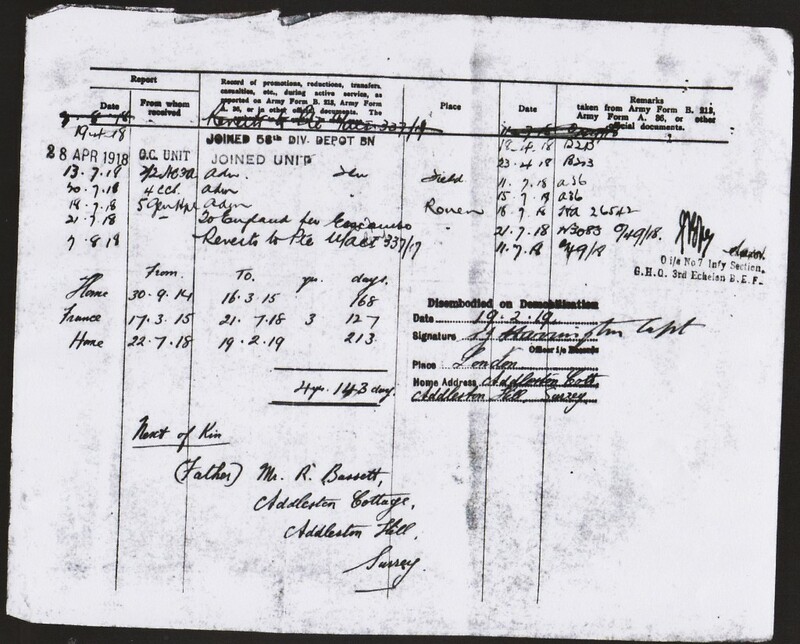 But I can tell you where he was between returning to England in July 1918 and reverting to Private in August. I have a copy of a document which tells us that on 22nd July he was admitted to 1st Eastern General Hospital in Cambridge to be treated for boils on his wrist and buttock! Oh dear. He’d probably be mortified if he knew I’d told the whole world. Nice article! I’ve done research in the same area for the same battle, but never managed to put it together as well as you have here! 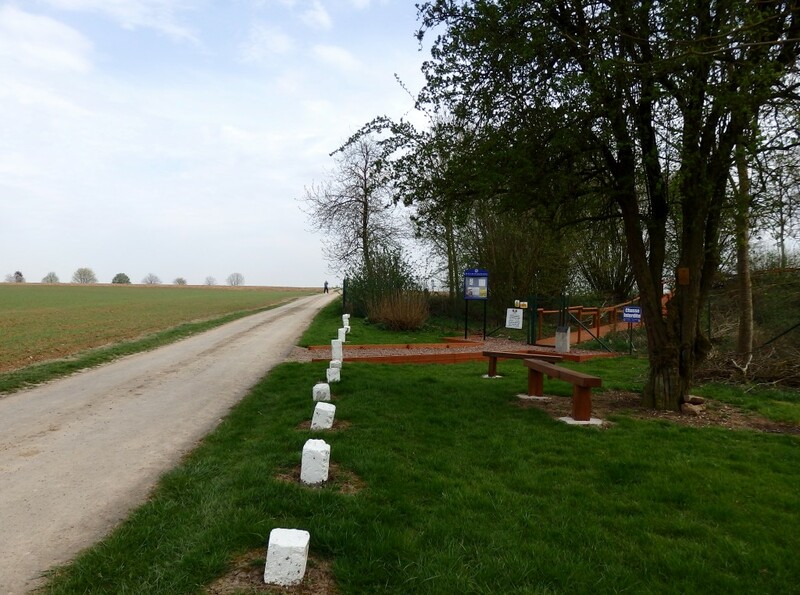 I’ve also walked the field from the British trench lines through Eaucourt Abbaye (Farm), over Snag and onto the Butte on a cold rainy January morning… with no shell or heavy machine gun fire, and with no mates falling beside me. It still was not easy! The mud is still sticky so don’t attempt it unless you have heavy boots on! And don’t dig, there’s shells all over the place still, even 100 years on! I actually stumbled over one of the 25% that fell as duds! (Luckily I was treading carefully!) Anyway, I’ve come to the conclusion that I’d have been shot as a coward, it was scary just to think about it as I staggered my on way. I’m not sure I would have left a nice safe trench! Thanks for sharing this story! Fantastic to hear about Mr Bassett story and that he survived the carnage… we often only remember those actually killed in battle. Often its those left behind, with the guilt that goes with surviving, that get forgotten. Same holds true today unfortunately! I’ll proud to say I’ll be at Thiepval Memorial on 1st July this year, 100 years later, remembering all those that went through the grinder of the Somme. I’ll also have a drink in Albert in the evening, toasting their memory! Hello Keith. Thanks for your long and most interesting comment! And for your incredibly kind words; you clearly know the place well, which makes them even kinder. The family story you tell is a tragic one indeed. And honestly, that six year old not paying attention! 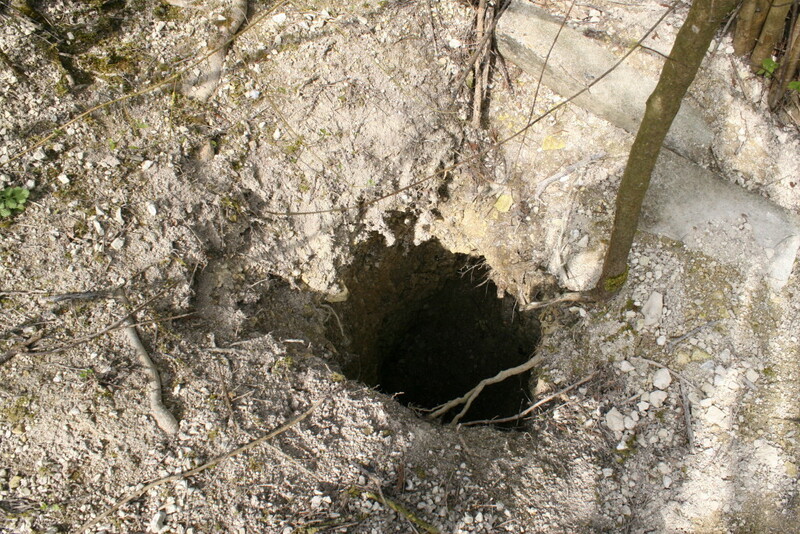 I nearly trod on a Stokes mortar round last year (see http://thebignote.com/2015/09/21/travels-on-the-somme-part-two-the-leipzig-redoubt/) so I know how that feels! And I am extremely jealous that you are going to be at Thiepval on 1st July. Take a wander down to the Leipzig Redoubt while you’re there if you haven’t before. 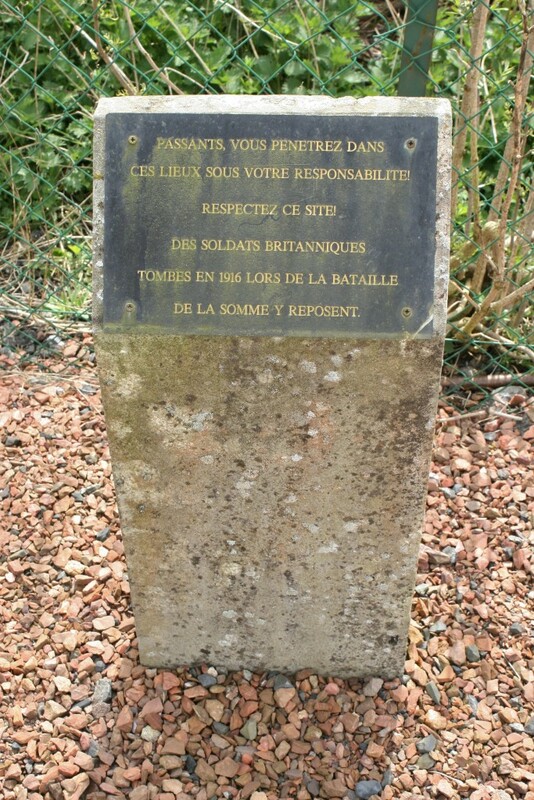 But I mustn’t grumble; I shall be over there next month with the Friends of the Surrey Regiments (my first ever organised tour – usually it’s just me and Baldrick, my faithful Belgian chauffeur and ace headstone spotter. I shall have to be well behaved!). And finally I must wholeheartedly agree with your comments on remembrance. So often the men that survived are overlooked and forgotten, many having to live for decades with the effects of the war – if you look through coroner’s inquest forms for the nineteen thirties and forties, you might be surprised how many list, either as a cause of death, or sometimes even the cause, as being a direct effect of war wounds. I have a future project, if I can overcome one final stumbling block, that will address this issue. These men need to be remembered. Thanks once again for taking the time to comment, Keith. 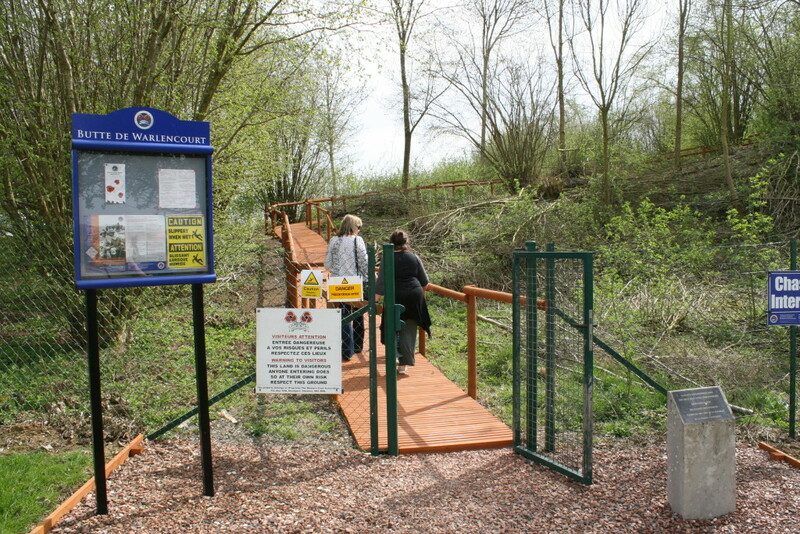 And have a drink on behalf of this site in Albert in July. If I’m not being a tad presumptuous to ask. Have a great time. My Great, Great Uncle Henry Oscar Hendry served with the 1/7th London Battalion and also fell during the first attack on the 7th October. His body was never found and so his name is recorded on The Thiepval Monument alongside 72,000 other British and Commonwealth soldiers who have no known resting place – Lest We Forget! Thank-you for this enlightening account and photographs. My Grandfather was in 6th battalion Durham Light Infantry, posted missing on 5.11.16 and I have a photograph sent by Red Cross to his family. It shows him in rag-tag disarray in a ‘lazarette’ ( hospital ) in a prison camp in Orhdurf in Germany..other prisoners appear to have worse wounds than he. A later Red Cross photo shows him: smart, clean and looking adequately fed in clean woollen uniform. My Mother could never speak well of him as her childhood was blighted by his absence from her early life, and the damaged man who returned…taciturn, withdrawn and uncommunicative for the rest of his life. he showed no love for any of his family. Sadly, I was fearful of his dark countenance and equally dark moods and had little contact. Only now, having access to so much information via the internet, do I begin to understand how my family was impacted upon by a ‘survivor’ of those events, now being closely examined, 100 years on. Thank-you again for furthering my understanding. Gill, that is such a sad story, but thank you so much for taking the trouble to write it for us. Something I bang on about quite a lot on this site is that although, quite rightly, we remember the men who gave their lives, we need to also remember the men who were lucky (?) enough to survive, many of whom, like your Grandfather, carried the scars, physical or mental (or both) for the rest of their lives. I always like it when I find war memorials that name all the local men who served, not just those who died. I have a major project in mind with regard to men who survived the war, although it is taking time to get the necessary permissions I need in order to publish what I intend to. Watch this space. But don’t hold your breath! Thanks again for your comments, and I’m glad I could give you a little insight into the fighting around the Butte. So 100th anniversary at the Thiepval Memorial was a fantastic event, 10,000 people attended and it was extremely well run by CWGC. The day included transfers to/from Thiepval from Albert Station, Breakfast and Lunch too all run flawlessly. I’m sure you saw it on the TV, & the News if nothing else? 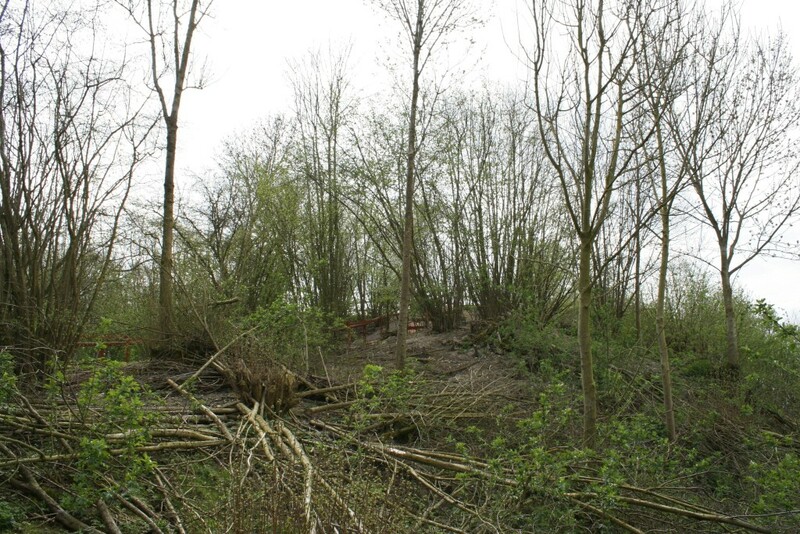 I didn’t make it down to the Leipzig Redoubt, as my historian friend and I had a full itinerary for the weekend including a revisit to the Butte and Eaucourt Abbeye area to look at ‘The Tangle’ and also reports of a piece of corrugated iron still in place over a bit of trench… alas the stinging nettles didn’t let us get even close to the spot! No kicking of artifacts this time either! 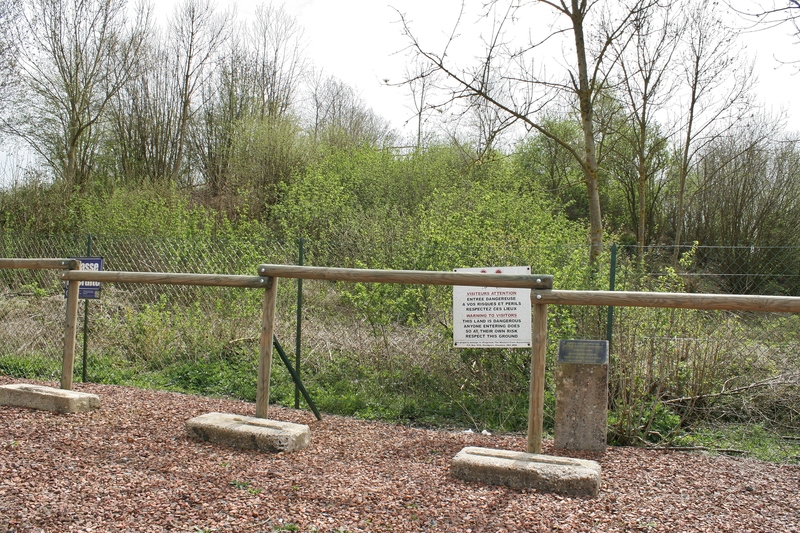 I have some great photos of different memorials and related things in the area, including the German memorial near Le Sars which I found again, still hiding and still in disrepair (maybe we could combine to help the German WGC to pay it a bit of attention, or move it to Fricourt or something?). Let me know where to send photos to for your evaluation… until then, pack up your troubles and smile! Yep, saw it on TV. 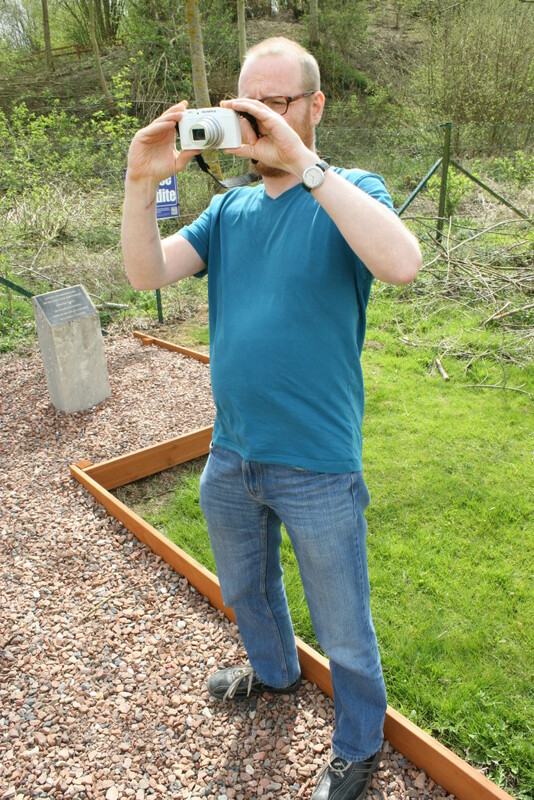 And it sounds like an excellent time was had, Leipzig Redoubt notwithstanding. May I mail you off-site Keith? I have your email address. We can sort out photos that way. 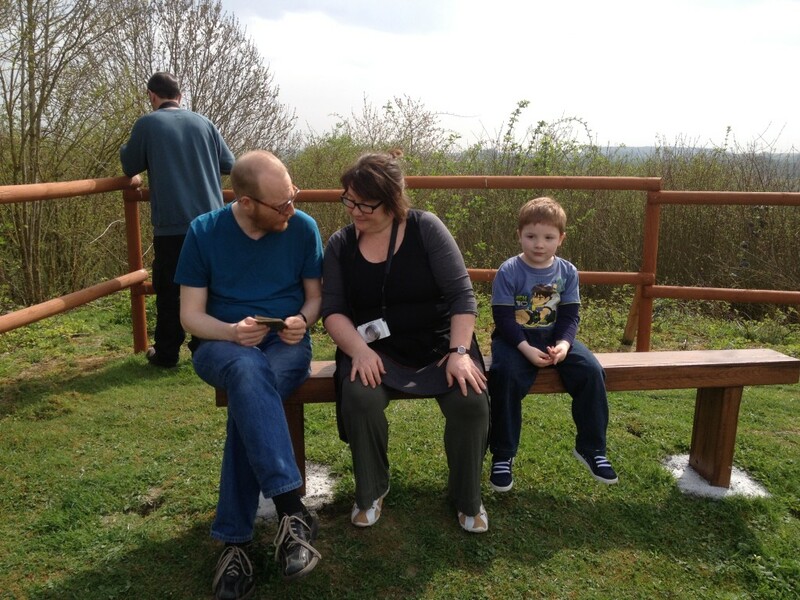 I have a very busy weekend – 10th wedding anniversary – mine! So next week if that’s ok.
Bless ya Chris! Thank you. Of course email off site is cool… I out touring off and on at the moment so intermittent responses, but I will get to you! No problem – and thank you! Apart from the map reference (or are you saying that it is a wrong reference? I’m rubbish with map references I’m afraid) I can, Morag. The Seaforths and others attacked the Butte on 12th October and clearly at least one of them reached Snag Trench. Donald Mackay’s body was soon lost (perhaps buried in the trench, although the exposed position of Snag Trench suggests otherwise), and the Burial Return Form (dated 1926) shows that when his remains were found (in what appears to be an official IWGC ‘sweep’) he was originally listed as an unknown soldier, until objects found with him confirmed his identity. 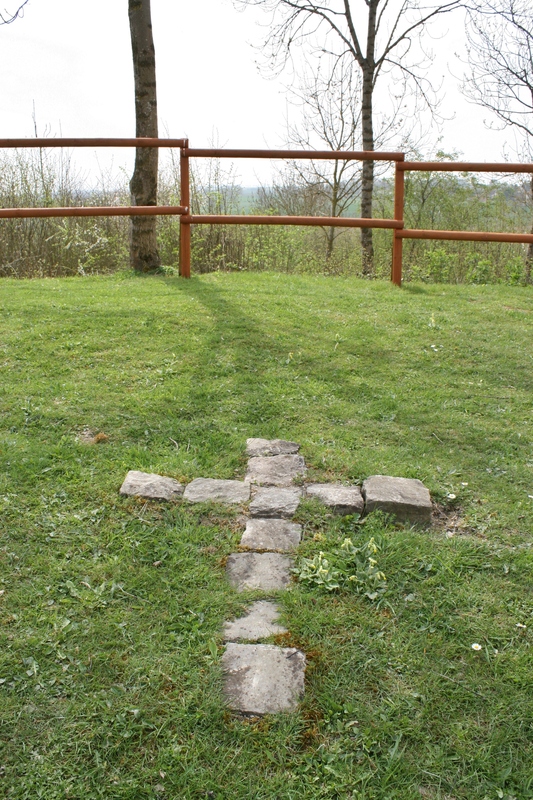 Cabaret Rouge remained open throughout the 20th Century for the burial of men whose bodies were still (and are still – thirteen burials in British cemeteries around Ieper in the first six months 2016, and 18 totally unkown soldiers – even which war they died in – in the Belgian Military Cemetery at Houthulst in April) being found on the battlefields, so there’s no surprise he ended up there. Which brings us back to the map reference? Have just found your excellent site. I visited the Butte a year ago,mainly because I wanted to find where my uncle George Dixon fell(no known grave) with the 9th Battalion D.L.I on 5th November 1916. I did not realise until we were back that there was a cemetery fairly nearby and where his remains may have been interred . 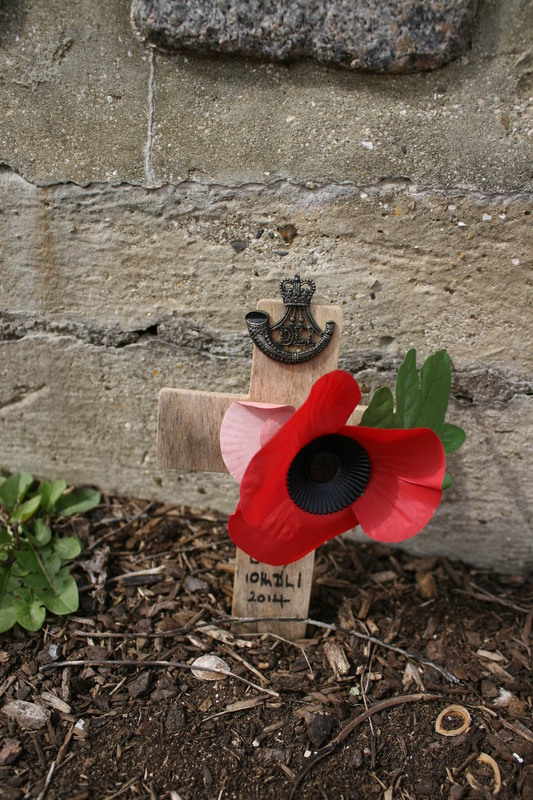 Another brother, Ned, was killed the year before at Sanctuary Wood (also 9th) and another one, John, received the M.M. medal and survived. My father William also survived but like ( Gillian) above he was always withdrawn. At his funeral in 1959 a relative told us that Billy was 24 hours in a shell hole wounded before being rescued. All were pitmen in High Spen and they certainly did there bit. My father hated politicians- – –no wonder! Hello Joe. Firstly, thanks for you kind words, and glad you found my site. I did a quick check on Warlencourt British Cemetery and there are 89 identfied D.L.I. men who died on 5th November 1916 buried there, of which 14 are 9th Bn men. As there are over 1800 unidentified burials in the cemetery, your Uncle could very well be one of them, I would have thought. And of course many of the graves in the cemetery come from the Warlencourt-Le Sars battlfield – the cemetery, don’t forget, was not made until 1919. I have read so often of men who survived but who were scarred forever by their war experiences. I have spent some time in recent years looking into this and discovered many men who died in the 20s, 30s & 40s whose inquest papers suggest Great War wounds/gassing as one cause (often secondary) of death. There is a story still to be told of the men who survived, of that I am quite sure. Thanks for the additional info`. 15 named officers were shown as killed,wounded or missing. Other ranks were 30 killed,200 wounded,161 missing. It must have been chaos trying to count numbers immediately after any attacks. A few years ago I did find a picture on the internet on the top of the Butte showing KING GEORGE V walking to the top with some Generals in 1919. Presumably he was being shown certain sites after the war– —-so it must have been regarded as very “interesting” to explain it to him. The DLI erected three large wooden crosses at the top and later they were sent back to Blighty – – –one is in Durham Cathedral. Yes, I know the photo of the King – one of his tours – I think he made some during the war too. I wish I’d known about the cross in Durham Cathedral when I was in Northumberland (see the Northumberland category, what else?) a couple of years back. Another trip required one day. Cheers Joe – I should also say welcome – I will do my best. The current Boesinghe tour should be good, if I say so myself. Could I ask you one other query? 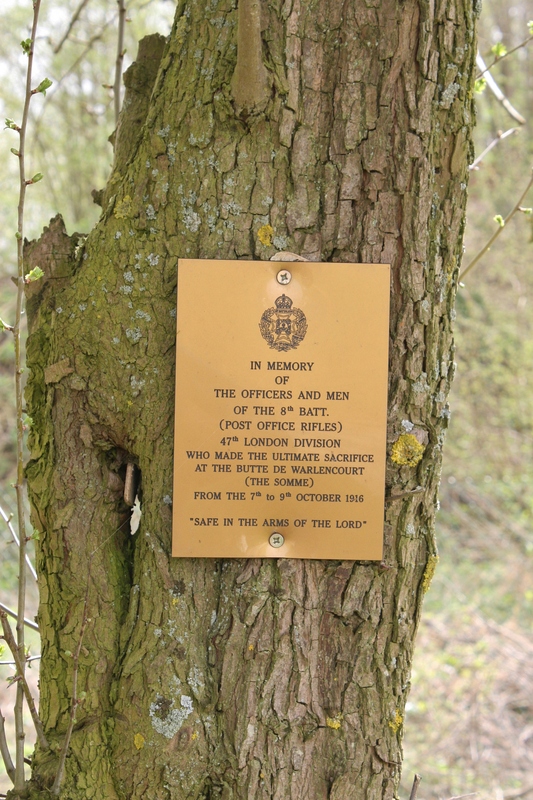 Do you have any access to the list of the 14 from 9th Battalion who were identified when buried. Joe, I can send you an Excel spreadsheet with the details of the 14 men if that helps, and if you give me permission to email you off-site. Yes please if I am able to “download” it. Have done so. Lmk if you get it ok (and check your spam folder if it’s not in your Inbox) and can open it. Hi there, just found your article searching the web for this topic, having recently visited the Butte and had a good ol’ field walk around it. Your info and detail has certainly helped me envisage what happened here..I found many relic items, it was surprising how much was still laying on the top of the soil! As it is in many parts of the Somme etc. But the Butte was different, I could imagine the intensity with the amount of shrapnel balls, shell shards, fuses, empty shrapnel projectiles etc I found. One item I did find, which I found most poignant was a sliver plate British tea (spoon) infuser, well, what was left of it, a luxury probably in the trenches. I found it, I would guess probably between what was Snag trench and the actual foot of the Butte. It was quite moving as it could have been used in the trench when we occupied it, dropped by a soldier attacking the Butte or sadly from a casualty..Anyway, just thought In would share this with you. Not sure how to send you the picture of it, I can if you would like me to..Otherwise, thank you for your article, I shall certainly be visiting the Butte again….Kind Regards, Paul..
Hello Paul. Glad you found me, glad you found this post of interest, and thanks for your kind words about the article. The Butte was somewhere I had always wanted to visit and once the diary came into my possession it became a necessity. I was actually on the Somme myself earlier in the month, and although we were at Pozières, no chance to visit the Butte this time. 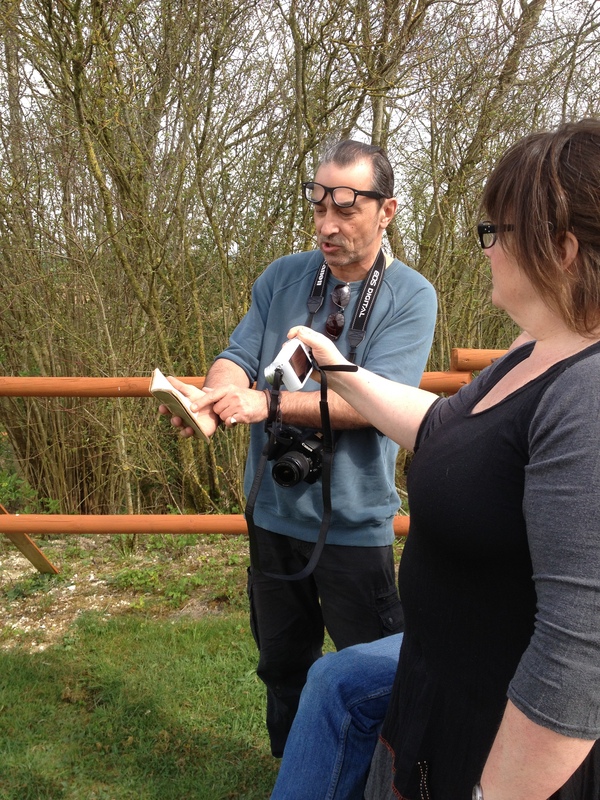 We did do some field walking, but although we found the usual pieces of shrapnel (and not a shrapnel ball among us!) and one or two other, er, items, nothing quite as evocative as your infuser. I would very much like to see it if I may? Legislation now means that providing you give me permission to email you (I have your mail address), then I can do so, you get my mail address, and I get to see the infuser. How’s that? Thanks again for taking the trouble to comment. This is so interesting and has given me an insight into what happened in the battle, my great grandfather and his brother were with the 1/7th London and were both killed on the butte de warlencourt on 7th October 1916. We are hoping to make a visit next year, thank you so much. As I mentioned above my great uncle was killed in this attack too, being a member of the 1/15th CSR, just a few yards to the right (east) of your grandfather & great uncle. I’ve done little research on this battle… perhaps this description will help with your visit? If you get the chance, drive over to Eaucourt Abbaye Farm (south) via the D11 from La Sars, as that was the direction the attack on the Butte came through on the 7th October. Park up and get out. Many visiting the area only go to the Butte itself, and miss the actually battlefield where so many fell. From the farm look across (down) due north (towards where the Butte is) and that is the field the 1/7th had to cross to get to The Mill. This Mill (Ruins) was the first objective for the 1/8th, and was on the D11, about half way between Le Sars and Eaucourt Abbaye. The 1/7th & 1/15th were supposed to pass through the 1/8th (at The Mill) and move on to The Butte. The Mill site shows up, if you ‘google map it’, as a small square field north of a little rectangle wood, by the junction with the road (footpath today) leading North/south from The Butte to the British start line. This is basically the route your ancestors took… You can actually walk this path from The Mill site to the Butte, but it’s very over grown! (Watch out for UXB’s and don’t touch/kick anything!). Description of the battle on the 7th October 1916. The attack start line was South of the Abbey ruins (Farm today) and moved due North… the 23rd Div. was on their left and they went through La Sars (in ruins) at the same time. “On the right the 1/8th London was stopped by massed machine-gun fire, as were the 1/15th London and the 1/7th London who were intending to leap-frog through the 1/8th to the final objective…” (The Butte) “…the attackers came under small-arms fire from Diagonal Trench but the 1/15th London and 1/8th London got forward on the right and dug in, along a sunken road leading north-east from Eaucourt l’Abbaye to La Barque.” (La Barque Road – see your map). “To the left, companies of the 1/8th London, followed by the 1/7th London advanced down the slope, forward of the mill and were fired on from Diagonal Trench and by artillery and machine-gun fire sited in depth, to aim cross-fire along the western slopes up to the butte and high ground to the south… ” (remember machine guns could shoot bullets nearly a mile!). Hope this helps, and I hope you get out there to see it! Thank you so much Keith, that is so helpful and such a quick response, I think we will planning our visit for spring next year. Thanks again. Keith knows his stuff. Thanks for your kind comments Bobbie. Hope you have a fabulous trip next year. Let us know!! Hello Bobbie, just to say my Great , Great Uncle of the 1/7th London was also killed on 7th October 1916 during the attack on The Butte de Warlencourt – so your two family members must have known mine. I haven’t been to Warlencourt, but instead we held a little ceremony at our local War Memorial with a piper playing ‘Flowers of The Forest’, on 7th October 2016. I suppose like my relative, yours have no known graves. It is all so sad and awful to think of what they went through and such a waste of human life.